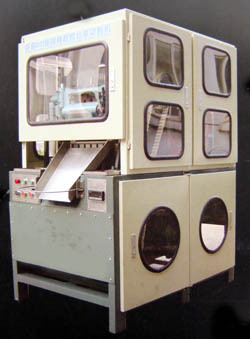 Our flock cutting machine is used for cutting high-impact specialty fiber like nylon, terylene, poly-acrylic fiber, vinylon, carbon fiber, fiberglass, metallic yarn, etc. And the flocking machine is widely used for chenille products/article, textiles, construction engineering fiber, silver prints and rubber etc. Three rollers transport the fiber tow into an injector, which feeds the tow to the rotating cutting blades using a water jet system. Based on the fiber tow speed and the number of cutting blades installed, the tow cutter controls the necessary speed of the cutting disc to achieve the required staple length of the fibers. The fiber staple are transported into the discharge hopper by gravity, from where the fiber are conveyed through the fiber flume by a stream of water.